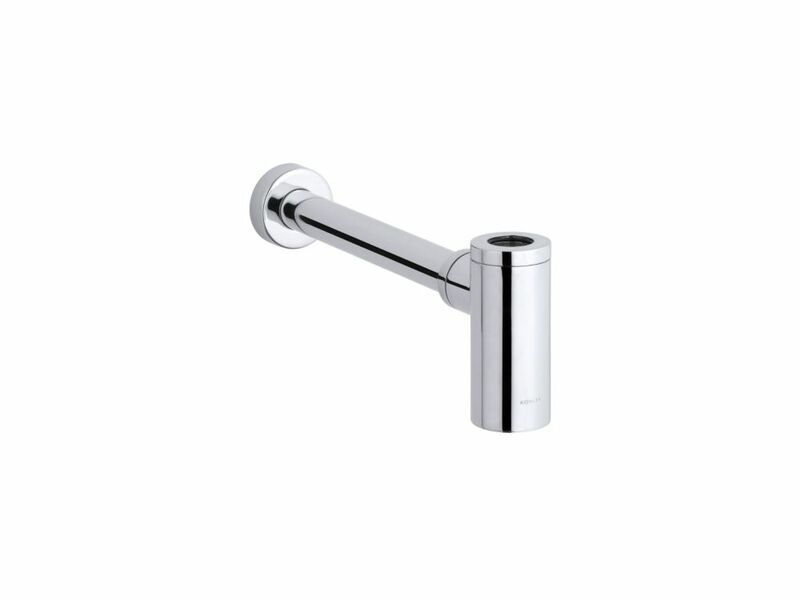 Contemporary Round Bottle Trap, 1-1/4 inch X 1-1/4 inch, Polished Chrome With a contemporary design, this bottle trap fits in the exposed area under the bathroom sink to provide an attractive alternative to traditional pipe options. This trap features solid-brass construction for reliability and durability. Contemporary Round Bottle Trap, 1-1/4 inch X 1-1/4 inch, Polished Chrome is rated 4.8 out of 5 by 9. Rated 4 out of 5 by Jtor1100 from Nice product except I did not realize that it was not 1.5 inch. The product description could ha... Nice product except I did not realize that it was not 1.5 inch. The product description could have been better. Rated 5 out of 5 by spotteddog from High Quality product from Kohler that Looks great in my Powder Room Renovation. Easy to install b... High Quality product from Kohler that Looks great in my Powder Room Renovation. Easy to install but keep in mind that you will probably need two additional items (both of which I picked up at my local Home Depot). I needed a metal compression nut to convert from the 1-1/4" Bottle trap exit pipe to the 1-1/2" Existing PVC threaded drain line in my wall. Be careful threading that one as it would be easy to cross thread. The escutcheon on the bottle trap covers it so it is not seen. I also needed an extension pipe from the sink drain outlet to go into the top of the bottle trap. Home Depot had longer ones with both ends threaded. I just used a pipe cutter (not a hacksaw as recommended) to cut it to length and it all went together easily. I like that this has a bottom that screws off for cleaning. I would be concerned long term about it getting gunked up with hair, but as this is in a Powder Room I think it will be fine. Would definitely use again! Rated 5 out of 5 by Lori from The quality of this trap is outstanding. The lower part of the trap is slightly visible under ou... The quality of this trap is outstanding. The lower part of the trap is slightly visible under our off-the-floor bathroom vanity as we knew it would be, and it is absolutely beautiful. The easy feature for unscrewing the bottom of the trap is an excellent feature for those rare occasions when someone drops a ring or something that needs to be retrieved. I would actually buy this particular trap even if it was going to be entirely hidden under a floor-standing vanity. Rated 5 out of 5 by Anonymous from Kohler bottle trap Product met my expectations. Easy to install, looks incredible and is quality built like most Kohler products. Perfect for my contemporary bath sink which has exposed plumbing. Arrived the day after I ordered it too. Rated 5 out of 5 by Nancy from Great looking trap I have a really tiny bathroom with a really, really tiny corner sink. So I wanted what was below it to look snazzy and bright. This worked perfectly and, of course, does the job it's designed to do. Rated 4 out of 5 by Ketchup99 from Looks great, but seems a slower flow rate We got one of these for a small powder room where the sink is set on a shelf and we didn't want to see the ugly PVC trap that would normally be used these days. It looks really nice and was fairly straightforward to install. My only concern is that after using it I noticed that it seems to drain slower than our other sinks. At first the water goes down quickly, but after the trap is flooded the sink slowly begins to fill if you have the faucet on full (which most people do). Since it is a small sink without an overflow, I'll have to make sure nobody leaves it running, etc. I would buy this and install it again, but it does seem like the it drains slower than I expected. Rated 5 out of 5 by Mike from Nice! Super heavy duty, great looking, complete surprise.